A handsome SOLID mahogany body and neck finished in a rich tobacco sunburst plays host to the famed Paul Beard "open" soundwell, resonator cone and spider bridge. 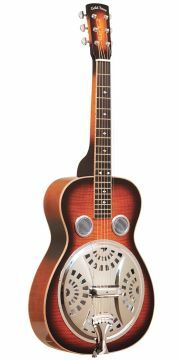 This all-solid wood workhorse resonator guitar is a Bluegrass stalwart that's ruggedly built to take life in the honkytonks in stride. Available as left-handed model.